Your precious old consoles and computers might be at risk of developing rust. Unfortunately it is inevitable no matter how much effort and love you put in preserving your collection and the question is not if but when. Don't feel bad if that has happened to you because there are many ways how to restore them to their former glory. Warm air can hold more moisture than cold air. That is why humidity is much lower during winter (~30% - ~45%) and peaks during hot summer days (~45% - ~80%). Condensation occurs when air cools down and releases moisture, usually at night. Moisture tends to attach to the most coldest surfaces which are nearby. Unfortunately for us, it is metal. First of all the good news. PCB's and their chips are very resistant to corrosion. Most of the times rust attacks steel and aluminum metal shieldings as well as various connectors which were directly or indirectly exposed to dirt and moisture. Rust does not form if ambient relative humidity is below 40%. You can monitor it with hygrometer which is a must have and can be cheaply purchased on eBay. Don't go lower than 30% because that can lead to electrostatic build up. There are two types of metals which we need to be concerned about - steel and aluminum. Both of these metals give early warning signs that they are starting to rust and if noticed in time they can be treated and restored without noticable damage. Store everything in sealed cardboard boxes. Plain brown ones, without any fancy colour pictures, are the best ones. They are made from paper and thus are able to breathe, have natural ventilation and can absorb and release moisture. Think of it as a sponge. You can throw in silica gel (moisture absorber) for some extra protection as well. There are cheap dehumidifiers which consist of a plastic case with water reservoir and a holder for moisture absorber tablet. The tabled absorbs moisture and converts it to liquid which does not evaporate. This is a must for your storage room during summer when moisture levels are very high. I recommend using 3M respirators because of their good reputation. 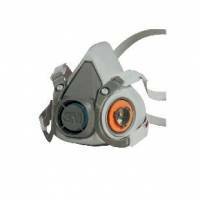 The following respirators are taken from European region catalog. Filter ratings for other regions might differ. 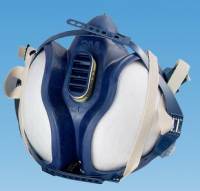 All 4000 series respirators have integrated filters while for 6000 series they are sold seperately. Once again, use respirator while attempting any of the following methods. If done properly, this is very effective and safe way to clean PCB's. Rust can accumulate more easily on dirty surfaces so this should be attempted only if the PCB is dirty. Remove all batteries before proceeding. Try to work fast but don't rush things. Fill plastic washing bowl with warm water, add washing powder and submerge the PCB in it. Use discarded tooth brush while submerged to clean off all dirt and residue. Rinse the PCB afterwards with luke warm tap water and use toothbrush at the same time to remove any leftover residue. Use micro fiber towel to soak up as much moisture as you can. Hold the PCB vertically and shake it to reveal hidden BONUS water from under the chips. Use hair dryer on lowest speed whith rapid movements. Distribute heat evenly throughout the whole PCB and do not let it get hot or it might warp. Shake the PCB now and then and clean any excess water with micro fiber towel. Failing to do so will leave water stains just like when washing a car. A better method is to use air compressor, if you have access to one. When completely dry, let is sit for at least one day before attempting to power it on. The best one I could find is Technicqll Zmywacz do stykow (Cleaner for electronic and electrical contacts). It is mild, does not damage solder mask of PCB's, removes light corrosion, solder flux and is ideal for cleaning PCB's with q-tips. It is generally meant for cleaning cartridge pins and pins of SMD and ordinary chips. The downside to this method is that q-tips will smear the dirt across the area being cleaned, you will have to wipe it off straight away with clean rag and no matter how hard you try, the PCB will never be as clean as when washed. More agressive than Zmywacz do stykow. Can be used for cleaning pins of SMD, ordinary chips and cartridge connectors. Effective for removing oxidation, light rust and provides basic protection against rust. Can be used with steel and aluminum parts. Use caution when cleaning steel because it can melt the galvanized protective coating and strip it to bare metal. Cartridge connectors can be cleaned with it as well using tooth brush. It is very effective for cleaning cartridge pins as well. Do not clean PCB's with it because it smears dirt and attacks solder mask. Use it to cover exposed copper if solder mask gets damaged and to seal off areas which had lots of rust. This will prevent oxidation. Can be used for removing rust spots, light surface rust, returning aluminum to its shiny finish and making steel smooth to the touch. Prepare a paste by slowly adding clean water to baking soda. The paste should be slightly wet with small amounts of excess water and not completely dry. Use teaspoon to crush the baking soda crystals as much as possible. The main goal is to achieve as less abrasive paste as possible. The paste can be used to clean cartridge pins, cartridge connectors with toothbrush, aluminum and steel. Gives better results than White vinegar and is very effective in removing rust from console cartridge connectors, other connectors and steel metal parts and keyboard springs. Submerge the connector or metal part in it and the vinegar should start to bubble. Check on it periodically and use a toothbrush to clean off the dissolved rust once in a while. Rinse the connector or metal part with tap water when no more rust is coming off. Use baking soda paste to neutralise the vinegar acid and use contact cleaner afterwards to protect them from flash rusting. This method is very effective with keyboard springs as well. Just make sure to clean them with baking soda paste before submerging in vinegar. Otherwise they will change color to black. Use it only after removing all rust and restoring the desired metal finish to remove any leftover rust and protect the surface. Otherwise it will convert rust to ugly spots which will remind you that it could have been done better. Consider it as a final stage for rust removal. This method is destructive so take great caution and use it as a last resort. It is meant for surfaces which have too much and too deep rust for baking soda, apple cider winegar or contact cleaner to remove. Never do it with aluminum. Practice on some unvaluable metal before attempring this on your restorable system. Set the dremel at high speed and start with 80 grit sanding disc. Use as light pressure as possible and make contacts with surface for short periods of time to remove all heavy rust. You can use 120 grit just to be on the safe side. It will take more time but will be less agressive. Clean off the repairable area with baking soda paste in betwean. You will notice new scratches where rust used to be. 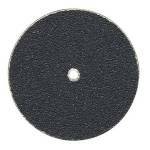 Move on to 180 grit sanding disc to clear those scratches which will reveal even finer scratches. Move on to the next recommended grit until the scratches are gone, you are satisfied with the result and all rust is gone. Finish the repaired area by cleaning it with baking soda paste, contact cleaner and finally with rust converter. Radials are great for fine works and when you need to remove rust from hard to reach places, usually where metal is bent. All purists will agree that the restored console or computer will never look the same. That is completely true so if anyone is experienced and knows more efficient way of doing a restoration, please share your knowledge and help us grow. Please keep in mind that this is a DIY so most of us do not have access to expensive industrial machinery. Please share your thoughts and suggestions in the forum or contact forum member Eidis if you have any suggestions on how to improve this guide.